I receive a lot of requests from people wanting to create Evernote templates. They have recurring notes that need to be a certain structure, and don’t want to have to retype them over and over again. This tip is stolen from Aaron Lynn on the journaling episode of The Productivity Show. He talks about how he uses Evernote for his journal, and he has a Templates notebook set up which contains his journal framework. Many people don’t realize that while Evernote doesn’t have templates per se, it does have a handy Copy To Notebook command. 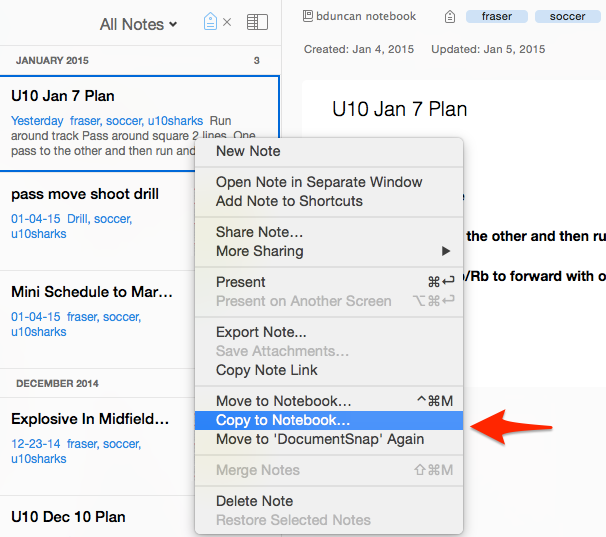 On Mac and Windows, just right-click on a note and select Copy To Notebook…. It will then ask you which notebook you’d like to save it to, and make an exact copy with the same content and tags. Very handy. Do you use templates in Evernote? How do you do it? 3a. Use Launchy to fire the script. 3b. Alternatively, I use Windows Task Scheduler to fire my “Journal” script/template every morning so its waiting for m.
Templates are a wonderful thing! Cool workflow Jeff – are you using enscript.exe for the script or something else? Great suggestion about scheduling it. Thanks! I enjoy your blog and enjoyed your visit on MPU while back. I am using the ENScript. I’m not a programmer and found it a little wonky to put together but found these resources to be really helpful.